Sweet Kissing (in Greek “Glykophilousa”) icons of the Virgin Mary are a frequently made style for they show most particularly the close and most tender relationship of Christ with His most pure mother. 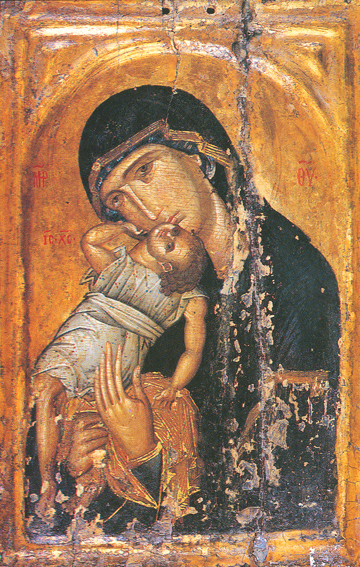 We see in this 14th century Byzantine icon the Lord with His head thrown back to touch His cheek carefully to His mother’s cheek, while His hand also tenderly reaches out to embrace her. They have a most endearing and wonderful relationship of love, for she is truly the best icon of obedience and love for her Son that we have in the entire history of the Church. It is this type of love and obedience that all who aspire to reach Heaven must emulate if they want to be with Christ and the rest of the Trinity for all Eternity. May we so aspire and so emulate! This icon was painted in Macedonia during the 14th c. and later brought to the Monastery of St. Catherine at the base of Mount Sinai in Egypt. Modeled after another more famous Pelagonian icon brought to St. Catherine’s during the iconoclast periods (a.d. 730-843), it was saved from destruction. The mistaken idea that icons were idols was refuted by the Church in Council in a.d. 787.